Mega-Girl was a superhero in her teens, saving the world, until she discovered that the world is too big to really save in any permanent way. She wants to make a difference that really counts for something in the long run, so she quits doing the superhero thing and goes to college, to educate herself about the best way to help the world. 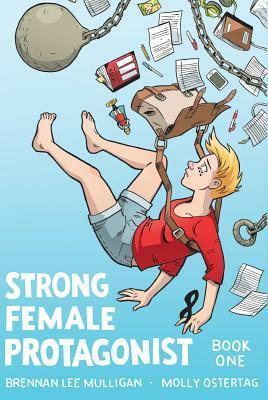 Along the way, she connects with her arch-nemesis on a personal level, argues with her friends about her decision to quit, and finds it difficult to live a “normal” college life with her non-super friends and classmates. And when the supervillains start showing up again, will Mega-Girl make another appearance, or will plain Alison go back to class? I enjoyed the philosophical and moral debates in this graphic novel/comic, especially since every character has a different view of the world, based on their own experiences, their super-abilities or lack thereof, and their own idealism of how the world should be. They are all such deep characters, with great backstories and internal struggles, good guys and villains alike. There’s a real emotional connection there, and I love dynamic characters! I liked that the plot keeps moving along with mysterious circumstances and underground intrigue. There’s plenty of action and plot twists, both with superhero stuff and with Alison’s personal life as well. I did NOT like that there is some profanity in the book, which nearly ruined my enjoyment of it. It’s not on every page, but it’s often enough for me to feel uncomfortable reading, and I took off one star because of it. Could have been a 4 star book, but they had to use nasty language for no reason. Because of that, I’m not sure if I want to continue reading the rest of this webcomic, but I’m so invested in the characters by now, and I need those mysteries solved… I’ll probably keep reading and just try to ignore the ugly words. C’est la vie.